Yad Le’Banim buildings are multi-disciplinary cultural centers that offer cultural, social, and artistic activities for the local community in memory of fallen soldiers of Israel Defense Forces and Security Forces. The location of the proposed Yad Le’Banim building within an existing grove at the local council of Ramat Yishay provides a unique opportunity to integrate landscape with the architectural design. This setting doesn’t only add a visual values for the building, but also add and symbolic aspect – the trees which are seen from all the building’s façades create an image that expresses the relation between life and death, between growth and loss. This relation is inherent in the definition of the Yad Le’Banim buildings as cultural and educational centers on the one hand, and as a memorials on the other hand. The project’s scheme allows freedom in orienting the different functions in relation to the physical properties of the lot and climatic considerations – the classrooms’ northern façades face the upper street; the entrance lobby’s southwest orientation utilizes local wind regime for natural ventilation during summer and wind protection at winter times; The library which opens up to the surrounding grove enjoys natural light and ventilation and offers the feeling of an open space, through which the garden passes. The design offers a re-interpretation to the typical double-slope houses of the historic Ramat Yishay. The typical section which was extruded and twisted defines two courtyards from both sides of the building while the entrance lobby at the center of the building connects between them and between the interior spaces. The building’s roof was designed as a significant part of the monolithic concrete envelope and not merely as a technical façade. 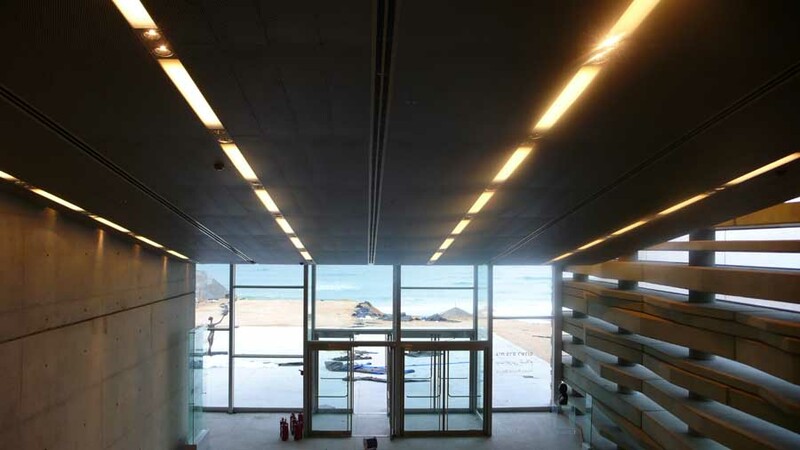 Windows for light and air ventilation located in the roof have a significant role in reducing the energetic costs of the building. In addition, the drainage channels that are immersed in the concrete not only offer a technical solution but also delicately mark the structure’s geometry. The site’s sloping topography, with a difference of about four meters from north to south, contributes to the way the building is experienced in its surrounding. Positioning the building in the middle of the site’s height reveals its facades gradually. From the upper street – its roof peeks but is not present. From the lower street, the trees create a screen which gives the building formality but not monumentality, which fits harmoniously in the environment. The architectural and landscape design offer variety of pedestrian movements through the building and in the open space around it – whether as direct transitions or wandering paths between the garden’s trees. The structure’s “twist” embraces the gathering plaza which overlooks the monument of the fallen and is aimed to serve for memorial ceremonies.